Location: Directly located at a bay ideal for bathing with its own piers. 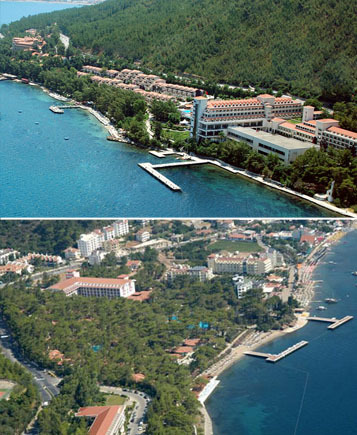 Walking along the beach promenade you can visit Icmeler, 3km away, or Marmaris, 5km away. Very good Dolmus connections (bus service). Location: Directly at the hotel’s own shore complete with bathing jetty, the beach is sandy/pebbles with a slight slope. Icmeler (approx. 3 km) and Marmaris (approx. 5 km). Dolmus connection.